Do I have to tell the IEP team about my child's medication? Home » IEP Advice for Parents » Do I have to tell the IEP team about my child’s medication? Do I have to tell the IEP team about my child’s medication? Do I have to tell the school about my child’s medication? That comes up at least once or twice a month in our Facebook group. There are many different tangents to this issue. Hopefully, I can give an overview of all of them. I also am including helpful links at the bottom for further reading. The decision to medicate or not medicate a child is a personal one. I would always maximize a child’s input in this discussion, conceding that many children often do not see the big picture or have this decision-making ability. They at least need to be heard. The decision to medicate a child is NOT an IEP team decision. Nor should a teacher or IEP team member ever suggest medicating a child. Keep in mind, someone’s obnoxious statements on medicating your child are not exclusive to being an IEP team member. I have complete strangers approach me in public to make all kinds of suggestions, knowing NOTHING about our situation. I think it’s just in some people’s nature to want to try to be helpful when they are not helping. My response to these “helpful” suggestions varies depending on my mood. I can be short and polite “Thanks, but I’ll stick to letting his team of physicians choose what we do” to snarky “Oh, I had no idea you’re a neurologist, congrats!” So navigate these conversations as you think appropriate. Keep in mind, it is not against the law or in violation of anything (except maybe your school district’s policy) to ask about medication. They can ask all day long. That’s not against the law. However, a school cannot demand or require that you medicate your child. Nor can they withhold an IEP if your child is “better” on medication. The law is very clear about both of those issues. Here is what Wrightslaw says about it. So, do you have to tell them? 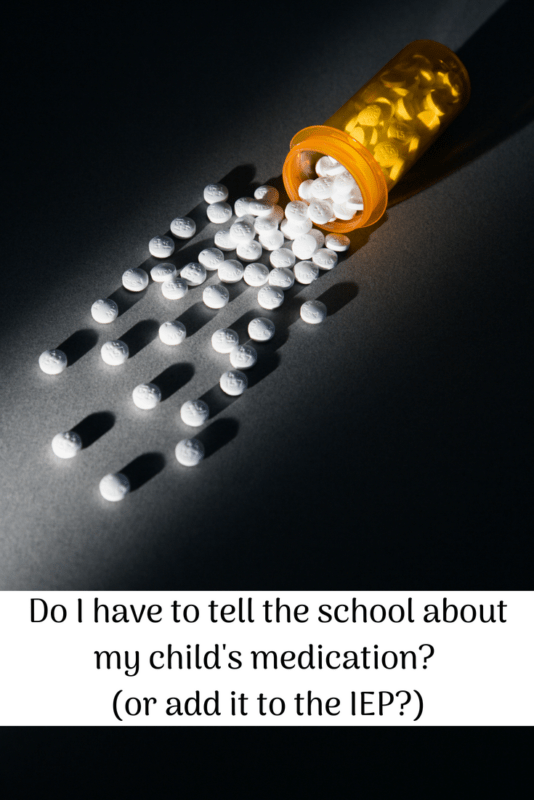 Do you have to tell the school about medications? IDEA does define this. Sort of. They talk about Mandatory Medication. 300.174 Prohibition on mandatory medication. (a) General. The SEA must prohibit State and LEA personnel from requiring parents to obtain a prescription for substances identified under schedules I, II, III, IV, or V in section 202(c) of the Controlled Substances Act (21 U.S.C. 812(c)) for a child as a condition of attending school, receiving an evaluation under §§300.300 through 300.311, or receiving services under this part. (b) Rule of construction. Nothing in paragraph (a) of this section shall be construed to create a Federal prohibition against teachers and other school personnel consulting or sharing classroom-based observations with parents or guardians regarding a student’s academic and functional performance, or behavior in the classroom or school, or regarding the need for evaluation for special education or related services under §300.111 (related to child find). Short answer, no. You don’t have to medicate your child if you do not want to. Nor do you have to tell them about it, if you choose to use medication. There are no medicine police and no one from ATF or FDA is going to come to hunt you down. Well, let’s hold on a minute. Why don’t you want to tell them? Reasons I don’t want to tell IEP team about Medication. I’m worried about the stigma of mental illness/ADHD and medications. He doesn’t take it at school, so why should I? I don’t want people to think I’m a bad mom. They will try to take away services if he does well on medication. What if they will try to change his placement or IEP based on this new knowledge? Can they “hold it against me” (or the child)? The fear they won’t keep this information private. And you know what? Those are all very good reasons. But here’s some other food for thought. Absences, Truancy and your IEP~What Parents need to know. If there is an accident, EMS personnel may need to administer emergency meds, so they need to know. What if it’s a new med and your child starts to experience side effects? What if it’s a blood thinner? So what can you do? You do have the safety concerns and think that the school should know. But, you also have all those other concerns. Yes, it’s that simple. You can tell the nurse so that he/she is aware and it’s in their file for an emergency. You can also ask her to sign a confidentiality agreement/release form that she is only authorized to release that information in case of an emergency (and define emergency!). Keep in mind, your child’s medical records, as far as what the school nurse has, is not covered by HIPAA. It is covered by FERPA. Many days FERPA isn’t worth the paper it is written on, but there are some things you can do if the nurse violates your child’s privacy. Check with your state’s licensing board and practice act and see if there is a clause about privacy and confidentiality and if you can prove it was violated. File a complaint. Yes, this is a dramatic response and should only be done in worst case scenarios. I’m telling you just so that you know you have options. 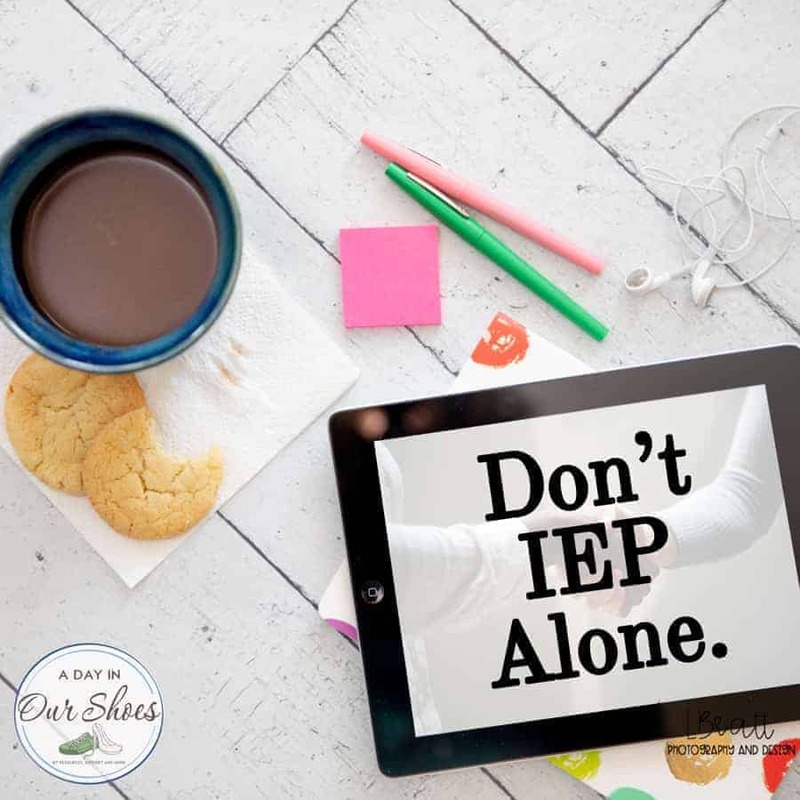 Medication really has no role in the IEP process, other than as an accommodation (such as a water bottle at their desk, or unlimited bathroom trips). It certainly has no place on the front page of the IEP, so if it’s there, remove it! And, if any of those other issues come up. Suppose your child is discriminated against, they try to withhold services or remove the IEP. Then you fight like hell, knowing that the law is on your side. Find an advocate, or join our Facebook group for assistance. Medication in lieu of services? But I thought of a different scenario this morning. My son is non-verbal. He’s been attending speech therapy for 10 years, still doesn’t talk. For argument’s sake, let’s say that is his only disability. In every other way, he is normal. If there was a pill, that was proven to work and proven safe with limited side effects, that would enable him to talk…I would start it today. And, let’s say every time I forgot to give him a pill, or we ran out…boom, back to no talking. I would still give it and try my hardest to not forget. And I would rip up that speech IEP and never look back. But that’s not a choice everyone would make. Some kids do really well on meds and need little to no assistance. Still, parents want them to be able to cope and adapt for when they are not on meds. Like I said, it’s a personal and parenting choice. Medication management is a life skill. A child/young adult must be able to manage their own medications if they are ever going to live independently. Make sure it is added to your child’s transition plan if they need it. My personal opinion and situation: My son is on many medications for seizures. And if you know anything about seizure management, meds are always being adjusted and changed. So yes, his teacher and school nurse know. The nurse knows which ones, and she helps me with day to day stuff. The teacher merely knows he is on meds. I assume she doesn’t bother memorizing which ones since they always call the nurse if there is an incident. And, I always inform the nurse and the teacher when we are doing med changes. I need their input on behavior, mood and seizure frequency when we are adjusting his meds. « What every parent needs to know about signing away FAPE.